GALION — Austin Hathaway and Josh Kent are this weeks Graders Greats of the Week. 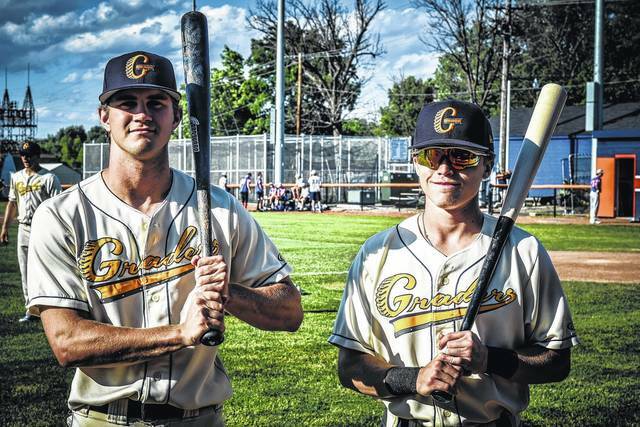 The Galion Graders opened their Great Lakes Summer Collegiate League season June 9. Through June 17, The Graders were 5-2. Hathaway just completed his sophomore season at the University of Charleston. He is a six-foot ,left-handed batter who had quite a first week with Galion. Austin is a graduate of Fredericktown High School. Through the first seven games of the season, Hathaway was 10/26 at the plate, equating to a .385 batting average. To further elaborate on that stat line, Austin hit two home runs, belted a double and a triple, drove in nine runs, scored six runs and stole two bases. Hathaway continued to stay hot after the June 17 came in Richmond. On Sunday June 18, he hit another home run, another double, scored three runs, drove in two and stole another base. Josh Kent is the usual third baseman for the Graders and will be a junior next season at Lenoir-Rhyne University. He calls Winston Salem, North Carolina his home. Kent stands 5-feet. 8-inches tall, bats left and throws right from the “hot corner”. In seven games, Kent was 11/30 at the plate for a .367 batting average. He had a breakout game back June 11 when he belted his only two homers on the season against the Grand Lake Mariners. In addition to the two round-trippers, Kent has three doubles, five RBIs, eight runs scored and three stolen bases. In games eight and nine on the season, Josh was 1/8 with a single and a stolen base. Congratulations to both Austin and Josh on winning the first Graders Greats of the Week awards!